Objections to the doctrine of the Trinity on the grounds that the Old Testament knows nothing of a plural-personal monotheism, and more specifically a tri-personal monotheism, are not textually warranted but are the natural fruit of a superficial reading of the Scriptures. When read closely, the Old Testament’s ties to the explicitly taught doctrines of the New Testament can be detected. 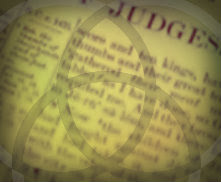 Whereas the last article examined the Proto-Trinitarianism in the book of Daniel, the present study will examine the much earlier book of Judges, demonstrating a very early revelation of the plurality of persons in the Godhead, the functions of each person, and the relations that obtain between them. Nevertheless, there are differences between the two books’ depictions of the Second and Third persons of the the Trinity. These bear brief mentioning here, but will be examined more closely in a later article. For example, while Daniel and Judges identify the Second person of the Trinity as the Angel of God/Angel of the Lord, only Daniel uses of him the titles Son of God, Son of Man, and Anointed One. Regarding the Holy Spirit, the book of Daniel identifies his work primarily with wisdom, knowledge, and the revelation of God’s Word (Christologically and Scripturally). This stands in contrast to the book of Judges’ stronger emphasis, it appears, on the strength given by the Holy Spirit to God’s anointed judges. These differences complement one another, the later depictions of the Second and Third divine persons (i.e. Daniel) building upon the earlier depictions of them (i.e Judges). The differentiation of the Father and the other Persons of the Trinity begins in Judges 2:1-5 & 11-12. There, “the Angel” of Yahweh identifies himself as the one who “brought [Israel] up from Egypt and brought [them] into the land that [he] swore to give to [their] fathers.” Additionally, the author shortly thereafter states that Israel “abandoned Yahweh, the God of their fathers, who had brought them out of the land of Egypt,” thereby implicitly identifying the Angel of Yahweh as Yahweh himself. The Angel’s appearances throughout the book, which echo Ex 3:7-9 & Num 20:16, number at fifteen. In all of these passages, Yahweh the Angel of Yahweh is recognized as the one who has come down from heaven upon hearing the cries of his people. As he told Moses that he “came down to deliver [Israel] out of the hand of the Egyptians and to bring them up out of that land to a good and broad land,” so too we are told that “the people of Israel cried out to the Lord on account of the Midianites,” and shortly thereafter “the angel of the Lord came and sat under the terebinth at Ophrah.” The Angel of the Lord came down from heaven after hearing the cries of the Israelites, in order to appoint Gideon as their judge/deliverer, just as he appointed Moses as their judge/deliverer upon hearing the cries of the Israelites during their enslavement in Egypt. The same situation, moreover, is implied in Judges 13, where the divine Angel of the Lord appears to Samson's parents, declaring the good news of salvation during a time of Israel’s oppression. Thus, Judges restates what has already been established earlier in the Pentateuch. The Lord is the sender of the (Angel of) the Lord. The Angel of the Lord descends to judge/deliver, and ascends upon fulfilling his redemptive task. Gideon has truly seen Yahweh face to face, even as Jacob and Moses saw Yahweh “face to face,” and yet he did not die. A casual reading of this text will fail to note that Gideon prays to the Lord whom he cannot see, for he is afraid he will die for seeing Yahweh the Angel of Yahweh. It is not the Angel of the Lord who answers Gideon, moreover, but the Lord who sent him answers Gideon. This implies that the distinction between the Lord and his Angel is real, personal, and not ontological. The Lord and his Angel share the same divine nature, but they differ with respect to their relationship to one another (one sends and the other is sent) as well as their relationship to men (one is invisible and the other is visible). This personal distinction between the invisible Lord and the visible Lord is also present in Judges 13. Whereas the invisible Lord speaks in Judges 6, telling Gideon that he will not die for having seen Yahweh the Angel of Yahweh, Samson’s parents come to the conclusion that if the Lord in heaven (i.e. the one to whom the Angel commands them to offer up a sacrifice) was going to kill them for having seen the face of the visible God/Yahweh/Angel of the Lord he would not have accepted their sacrifice. What this reveals is that God the Angel of the Lord is differentiated from the Lord who accepted the sacrifice from Samson’s parents. These are equally divine persons, therefore, who differ relationally (i.e. with respect to their relationship to one another, as well as to their relationship with men). …the Spirit of the Lord clothed Gideon, and he sounded the trumpet, and the Abiezrites were called out to follow him. …the Spirit of the Lord was upon Jephthah…and Jephthah made a vow to the Lord and said, “If you will give the Ammonites into my hand, then whatever comes out from the doors of my house to meet me when I return in peace from the Ammonites shall be the Lord's, and I will offer it up for a burnt offering.” So Jephthah crossed over to the Ammonites to fight against them, and the Lord gave them into his hand. Then the Spirit of the Lord rushed upon [Samson], and although he had nothing in his hand, he tore the lion in pieces as one tears a young goat. …the Spirit of the Lord rushed upon [Samson], and he went down to Ashkelon and struck down thirty men of the town and took their spoil and gave the garments to those who had told the riddle. …the Spirit of the Lord rushed upon [Samson], and the ropes that were on his arms became as flax that has caught fire, and his bonds melted off his hands. The Spirit of the Lord, then, is shown to come after Yahweh the Angel of God ascends back to heaven. He comes rushing upon those whom God has elected to judge Israel, gifting them with wisdom and power, just as he is sent to empower the apostles and, indeed, all Christians subsequent to the Son of God’s ascension to the right hand of the Father. Whereas the Angel of the Lord’s stay is brief, the Spirit of the Lord’s dwelling with men persists until the work of God in judging/ruling and delivering his people is complete. This, too, exactly reflects the temporal ministry of the Son of God on earth, which is followed the Spirit’s rushing in after the Lord’s ascension and equipping of the saints for ministering in the church until the Lord Jesus returns. Within the book of Judges, it is evident that the one true God exists not as a single person but a personally plural single being. God is shown to be the one who sends, the one who is sent and ascends upon the completion of his task, and the one who empowers his people to live in the world according to his laws and precepts until the Lord Jesus returns. The relationships between the three persons of the Trinity, as articulated by the Lord Jesus Christ in his Upper Room discourse, are given to the people of God in this historical book, albeit as a preliminary sketch of what would only become clearer over time. See Judges 2:1, 4; 5:23; 6:11-12 & 21-22; 13:3, 13, 15, 16, 17, 18, 20 & 21.
 cf. Ex 2:23-25 & 3:7-8.
 cf. John 1:18; Col 1:15; & 1st Tim 1:17.
 cf. John 1:18 & Gen 32:30. For more on the descending-to-save/ascending-to-receive-glory Christological themes of the OT, see Diaz, Hiram R. “Proto-Trinitarianism in the Book of Daniel,” Biblical Trinitarian, http://www.biblicaltrinitarian.com/2017/01/proto-trinitarianism-in-book-of-daniel.html, accessed February 6, 2017.
 cf. Jud 3:10;6:34; 11:29; 13:25; 14:6; 14:19 & 15:14.
 cf. Rom 12:3-8 & 1st Cor 12:4-11.